Comments: Fender switched back to the blackface era cosmetics some time in 1980. 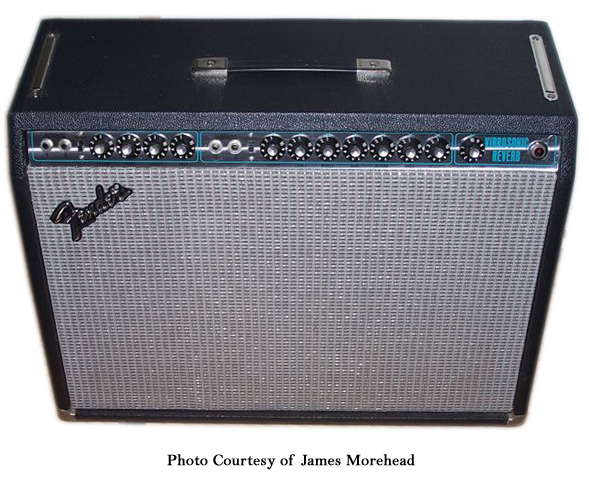 Vibrosonic Reverbs produced between late 1980 and 1981 have a black control panel and silver sparkle grille cloth. A Line Out jack, hum balance pot, and a pull boost sw. were added near the end of the models run. This amp does NOT have a bias pot but instead subbed in a output tube matching pot. This allows you to use slightly unmatched pairs in the amp but does not serve as a bias control leaving no way to accurately bias the amp without modification. An amp with an output tube matching pot vs. a bias pot can easily be biased by changing the value of the resistor that is soldered to the tube matching pot. An increase in the value of this resistor will decrease the current in the tubes … a decrease in resistance in the value of this resistor will increase the current flow in the tubes. By installing a trim pot in place of this resistor, the bias can be varied even easier. Looking to sell one. Any info about outlets would be helpful. I just bought a 1974 “according the first owner” Fender Vibrosonic Reverb with SN#A825522. You’ll need to produce quite some noise for a few secs before it sounds great/clean. I discovered one of the high voltage elco’s (220MFD) is leaking witch explains a lot. Also I notices the coupling capacitor between pre-amp and pahse inverter of the power amp is burned a bit and has blisters. I got rid of one of these like a fool in about 1982. I would love to have it back. It sounded better with my Gibson ES335 than any amp I’ve had since then. Hi John, I;m looking to buy! Where are you located? I have one of the last 1981 silverface versions with a 15″ JBL, and it always pleases me to play and hear it. Quiet, big, and clean. It is like a Twin Reverb with a 15″. NOT FOR SALE. For years I have this amp,nice sound for my steelguitars.I just changed all of the tubes becouse of a ticking and burbeling sound.You can still hear it when you on te amp.maybe the high voltage elco’s are leaking too. Dificult to find out without tools. Also wish to identify the speakers. All the charts I’ve looked at have A + 5 digits, so this confuses me a bit. Also, I see only Vibrosonic Reverbs with single 15″ speakers.